Welcome to our top picks guide to the best speakers on the market, where we have carefully curated the most acclaimed speakers on the planet based on scores, user reviews and overall performance. This guide features the creme of the crop with our top picks in each speaker category from each of our in depth buying guides including the best bluetooth speakers, the best bookshelf speakers, the best computer speakers and last but not least, the best outdoor speakers. In this guide we have rounded up what we at SpeakerNinja believe are the best in terms of performance, overall user satisfaction and of course their reliability and durability, which is especially applicable to the the best outdoor speakers section, as these often have to withstand the harshest of elements. Our team spend hours of research in order to ensure that we bring you only the best of the best after hours of research and pooling across dozens of bestselling speakers in our various buying guides. Bluetooth speakers have in recent times become the new boomboxes. They are however significantly more portable, they conveniently need only a single playback device as opposed to lugging around a bag with all your CDs and tapes around, and they are able to easily slip into a backpack, going completely unnoticed. Most are able to maintain loud volumes and excellent audio quality for long periods on a single charge, keeping you entertained for hours in most environments. On top of this, most are really durable and easy to pair with playback devices that are Bluetooth enabled and can also connect via aux cables or come with built in FM Radio or SD card slots. Be sure to check out our post on how to deal with Bluetooth speaker stutter, which could help improve your listening experience. 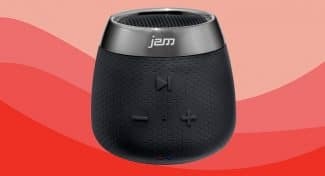 Here are our top picks of the Bluetooth Speakers with, one from each respective subcategory, ranging from the best Bluetooth speaker under $50 to the best high-end Bluetooth speaker. 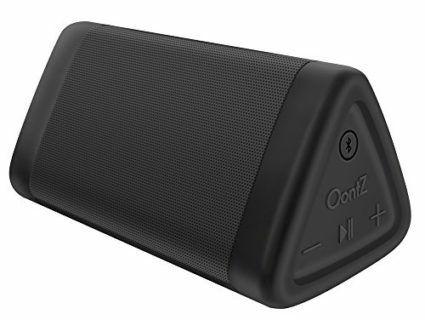 The Amazon Cambridge SoundWorks Oontz Angle 3 portable Bluetooth speaker has a triangular prism casing that is said to be quite sturdy. Its sound quality has been praised by most users and the bass is seemingly plenty for a speaker that is 5.2 x 2.8 x 2.5 inches, weighing in at 10-ounces. It is also exceptionally portable and has a battery life of about 12-hours when played at reasonable volumes. Its Bluetooth connection is stable, reaching around 30-feet unobstructed. The IPX5 rating means it is splash resistant, but cannot be fully submerged in water. It is also rainproof, dustproof and sandproof, making it a good beach companion. The built-in mic gives it hand-free speakerphone capabilities that has received no complaints from customers and it has an aux-in jack for plugging in non-Bluetooth devices. The SoundWorks Oontz Angle 3 is a great choice for outdoor socialites looking for an inexpensive solution to portable music. The Versatile Amazon Echo is a rather intuitive Bluetooth speaker that has received more than 50k reviews on Amazon, with roughly 42,000 of those in favor of this smart device. Alexa, which is Amazon’s artificial intelligence voice-activated virtual assistant, makes the Echo user’s experience significantly more enjoyable and easy. 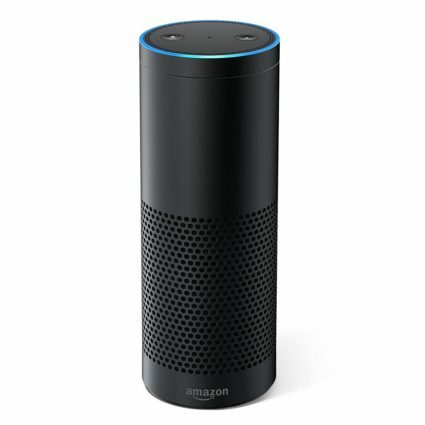 One is able to give vocal commands or ask questions from a distance thanks to the far-field microphones, which will get an adequate response from Alexa. Alexa is built in the cloud and she is constantly getting smarter as you use the Echo more, adapting to the speech patterns, vocabulary and personal preferences of the user. There are many supporting features thus far, such as answering questions, reading audiobooks, playing music from Spotify, Amazon Music Unlimited, Pandora, iHeartRadio and TuneIn. These are but a few examples, the the Echo truly is capable of a lot. The Echo has “skills”, and are able to order Domino’s pizza, call an Uber and it can even control your smart home so far. The list of skills are growing constantly. 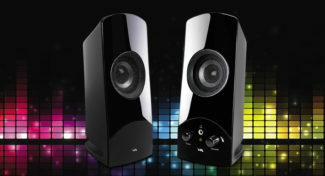 The sound quality of the speaker has been warmly received, with majority of the buyers users liking it. A few critical mentions seem to surround the customer support, with support seeming to be equally as confused as customers about certain features. The Amazon Echo is truly a versatile smart speaker that offers users convenient hands-free operations. With computers becoming more powerful, they are able to play movies, games and music at exceptionally high qualities. Along with the visual aspects of games and movies improving, the audio quality is becoming significantly better requiring the right speakers that do not take away from the overall experience. 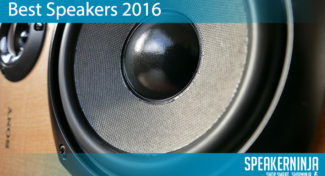 Here is our top picks for what we at SpeakerNinja believe is the best computer speaker. 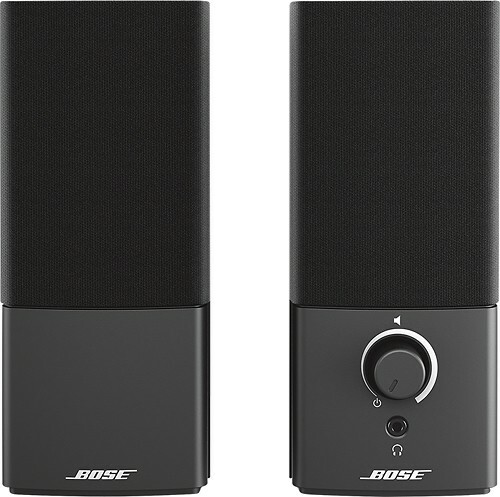 The Bose Companion Series III computer speakers are made from durable plastic and many have found that they pack a lot of power for a 2.0 system. Their loudness and minimal distortion have impressed many users, although there was one user who found that music sounded like it had a reverb on, which means it sounded tinny to this particular user. They are said to deliver a good amount of bass for the speaker size along with a decent overall sound according to most other users. There were some reports that the aux cable was slightly too short at 4 feet, with users wishing that it could be slightly longer to accommodate their specific setup better. It switches on and off via its volume button and does not indicate whether it is on by way of an LED light, which is ideal for those looking to use them in the bedroom with a TV without being bothered by an ever present glow. The headphone jack that is included allows for discreet listening when need be, without having to pull out the aux jack from your computer every time you need to plug in your headphones. 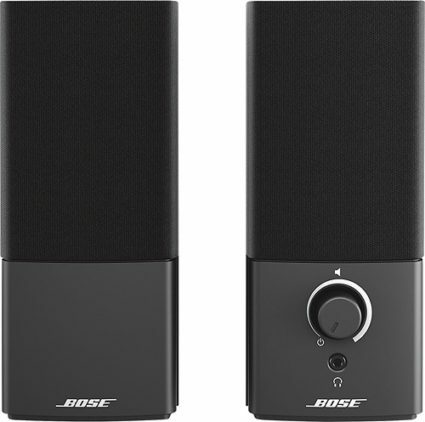 The Bose Companion 2 Series III computer speakers have a strong bass and decent overall audio quality, however, those with a trained ear may find them to sound slightly tinny. The following section will highlight the bookshelf speakers that we believe offer clean and powerful sound within their respective price ranges. Bookshelf speakers are excellent for home theater systems, greatly improving your movie audio quality. They also give you the ability to play music flawlessly, with most having tight, accurate bass responses, warm mids and incredibly crisp high responses that are not too harsh on the ears. If you find that the 2.0 setup you have bought does not reach those low notes you crave, one can always buy a subwoofer that will easily beef up your system. One needs to also bare in mind that most of the bookshelf speakers on the market today are passive speakers that require some kind of amplification to power it. Check this article by PCWorld.com to get some further clarity on passive and active systems. The Mackie CR3 is an inexpensive solution to entry level studio quality audio. 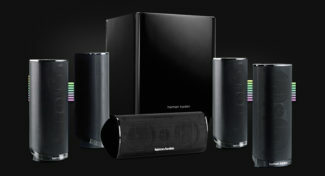 Marketed as multimedia speakers, they are designed for critical listening applications. They come in 3-inch, 4-inch and 5-inch models, but we are focusing on the 3-inch model. While some reviewers did not like the green ring around the tweeters and drivers, the speakers have an overall neat black finish. The tweeter is a ¾-inch silk dome tweeter and reproduces crisp highs. One user did point out that they do slightly hype the mids and bass and that the overall frequency response is not as flat as higher end monitors, but for the price, their overall sound reproduction is solid. Totalling at 50-Watts of power, they are more suited to smaller rooms, because of their lower volume output. Their frequency response ranges from 80Hz- 20,000Hz, and due to this some did find that there is a decent amount of bass, but some of the lower notes are cut out. The are two front panel aux inputs for headphones, smartphones or tablets, and a volume knob for adjusting the volume. Some did find that during hotter periods, the speakers can overheat, needing to be switched off for 30 minutes before they are usable again, but this was also dependent on how loud they were being played. The speakers switch off to protect the circuitry from frying from excess heat, so it is arguably a rather useful feature. There have reports pointing towards overheating issues with the Mackie CR3, but for the price, the sound quality is great, especially for those looking for entry level bookshelf speakers that are excellent for critical listening applications. The ELAC B6 bookshelf speaker has been described as offering a “stellar, best-in-class sound quality” by CNet.com, already justifying this well priced bookshelf speaker’s spot in our Top Picks section. Its low end tramples all over the competitors and the mids and highs, offering the warm and crisp sound that would appeal to most audiophiles, offer a wide and deep stereo soundstage. Many users reported that the dynamic range that these offered were incredible for their price range. The brushed black vinyl finish will undoubtedly add a nice decorative touch to most rooms. An amp like the NAD C 316BEE would be the right choice for these, allowing the B6s to perform at their best. The speaker’s dimensions are 10 x 8.5 x 14 inches and weighs in at 32.6 pounds. The woven aramid-fiber woofers are 6.5″. 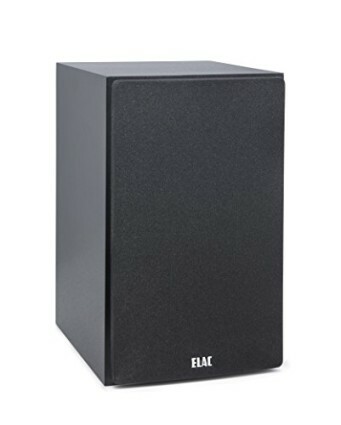 The ELAC B6 is an excellent bookshelf speaker that, if paired with a good amplifier, can outperform most bookshelf speakers in its price range. 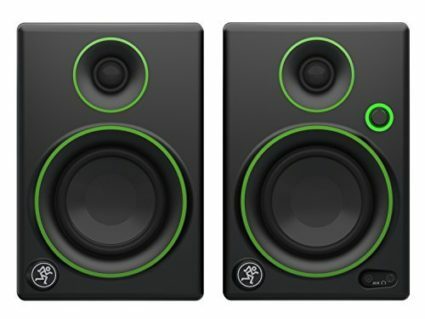 The ELAC B6 delivers plenty of bass and has a warm and clean overall sound, but it may be too bass heavy for some. 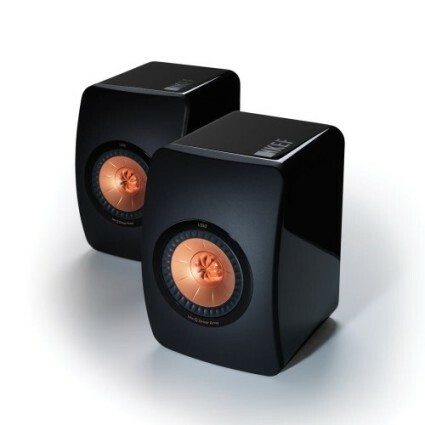 The KEF LS50 bookshelf speaker has blown away users with its accuracy. The Uni-Q drive-unit is responsible for the incredibly clear, uncluttered audio and the wide stereo soundstage produced by these. 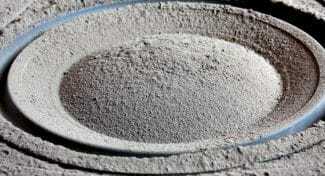 They are also said to reach great volumes without distortion. There have been some reports of a possible lack of midrange detail, but opposing reviews have suggested otherwise. Because of the wide dispersion of the LS50s, they need to be carefully placed in a room so there is no real obstruction. Stereophile.com have given a fairly accurate description of their placement methods to achieve the “optimal top-octave balance”, along with an incredibly in-depth technical description of the speaker. The speaker’s dimensions are 10.9 x 7.9 x 11.9 inches and it weighs in at 15.2 pounds, making it quite small, but explosive in its performance. The KEF LS50 is truly an impressive bookshelf speaker that packs a seriously professional punch for its size. The KEF LS50 is a pricey bookshelf speaker, but it delivers awesomely accurate sound and an awesome soundstage. With the drastic improvement in technology in recent years, speakers have directly benefited, becoming more reliable, powerful and durable. 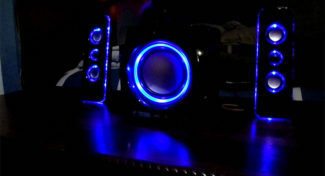 The invention of Bluetooth technology has also improved ease of use, making speakers ready to use in almost any area. The outdoor environment can now easily be improved with a wired or wireless speaker system that can withstand harsh weather conditions, while emitting great audio equally while it takes a beating. Also be sure to check out our post, What To Look For in Outdoor Speakers to assist you in choosing the right outdoor speaker for you. Here are our top picks for both wired and wireless speakers. The Polk Atrium 5 Outdoor speaker has received praise for its great sound quality and durability. Users found that their anodized Aluminum Tweeter Domes and their 5-inch woofer drives out a nice and clean overall sound that has a tight bass, rich mids along with crisp highs. Users found that they stand up to the elements well, be it rain, snow or extreme heat, earning them their positive reviews regarding their durability. Their frequency ranges from 60 Hz – 25,000 Hz, meaning they unfortunately do not pick up those super low notes that some users are looking for. They are easy to setup and install and require 10 watts – 100 watts amplification power. 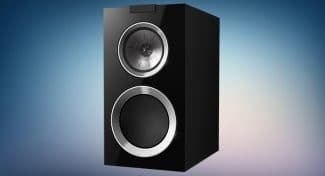 The Polk Atrium 5 delivers a nicely balanced sound, but they do not drop those super low notes that some bass heads crave. The Polk Atrium 5 is great as it delivers a nice and balanced sound. People who like bassy music may need to look elsewhere however, as these do not deliver the boom they may looking for. The unobtrusive Sound Appeal SA-FREE-CN is designed to look like a rock and they compliment the garden aesthetic pretty well. While they lack some bass, their overall sound has received good reviews from most Amazon.com users. Consumers found that they offer reliable Bluetooth reception as well as a solid reception range, maintaining uninterrupted playback. Their mids are said to be clear and their highs crisp, with very little distortion reported by user when they are played at high volumes. Their popularity and the very few negative reviews that they received show that the Sound Appeal SA-FREE-CN is a very reliable outdoor speaker and this is why it has earned a top spot in our Best Speakers guide. It is incredibly important to have a good audio setup, as it could mean the difference between feeling deeply frustrated and immensely satisfied. If one is a keen music enthusiast, one will know the importance of good sound and the frustration that follows after hours of attempting to get the audio sounding just right. In the following section we will be look at various ways to improve your overall listening experience and how to make the most of the speaker that you have purchased. It really is difficult to judge what a speaker will sound like based on reviews posted on sites by both users and professional reviewing sites. Obviously the best thing to do would be to go into your local speaker store and pick up your dream Bluetooth speaker based on your personal taste. However, not everybody has a speaker store in their town/city or they don’t have the means to go out and pick up their dream speaker, hence having to order online. We have a number of suggestions that could improve your overall experience with your Bluetooth speaker. Range – the range could be the main problem and bringing your Bluetooth speaker nearer to the playback source could resolve this issue. You may find that you were attempting to listen to it at its maximum range or beyond. Update Drivers – sometimes one will find that there drivers on their computer or mobile device are not updated. A simple update could drastically improve your listening experience. Try another speaker – try another Bluetooth speaker with your playback device. Sometimes your device may not be compatible with the speaker. By pairing your playback device with another speaker, you can easily test to see if this is in fact the case. It is quite rare to have compatibility issues however. Try another device – sometimes the issue is your playback device. Try and use your mobile phone if you are using your computer as the source, or a friends mobile phone instead of yours to attempt find the problem. In order to improve the sound quality of a speaker, simply tweaking the equalizer on your source could drastically improve your listening experience. Some playback devices have presets on that tend to boost certain frequencies and this may conflict with already altered frequencies on the speakers. We recommend downloading one of these equalizers apps for Android, or one of these equalizer apps for iOS when playing music off of your mobile phone. They could make a massive difference in your overall listening experience depending on what needs to be tweaked to bring the most out of your wireless speakers. We also recommend checking out CNet‘s article on how to improve your listening experience with placement. It has a lot of valuable information dealing with room size and acoustics and how this can affect the overall sound coming from your Bluetooth speaker. 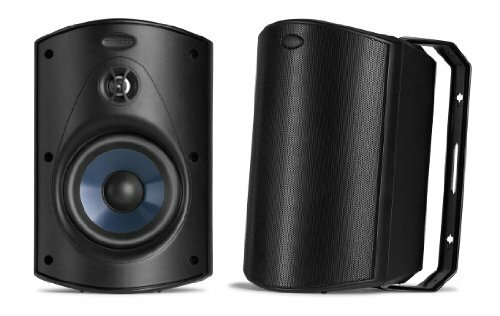 When choosing the right computer speakers, it almost certainly comes down to price range. High end computer speakers will generally deliver better audio quality than budget speakers. 2.1 systems will deliver more in the low frequency ranges and 2.0 systems will lack some of those low notes that a subwoofer usually picks up. 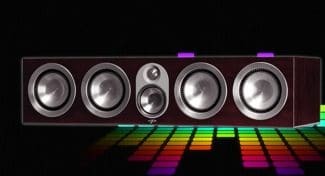 You should keep this in my mind when purchasing computer speakers, as bassheads will almost certainly be left unsatisfied without that thumping low end. Click “Enhancements”, where you you will be presented with various preset options to alter your listening experience, molding your audio to suit your palette. Lifehacker.com has also included an awesome article on how to tweak Macs to get the most of your computer speakers. Check this article that takes you through a step-by-step process, looking at equalization and what to download to mess with your audio, with the ultimate goal being improvement. As someone who does deal with some form of music production, I know from fooling around with equalizers and slightly dropping the mid range frequencies (between around 250hz-2000hz) you can bring some clarity to your listening experience. It is often the mid frequencies that are boosted in attempts to bring warmth to your listening. It may not sound great with all music genres, however, making the the overall sound reproduction quite muddy. Generally when it comes to improving your audio quality, one needs to also look at your sound card. There are three audio components that reproduce sound, with second and third generally combined. It starts with the sound card or the motherboard’s audio chipset, acting as a digital to analogue converter (DAC), converting the digital data into audible noise that we can hear. It is however far too weak to actually drive speakers or headphones, so it often feeds into an audio amplifier which will then power the speakers. Generally one doesn’t need a sound card, as most computers have a great onboard audio chipset that supports 5.1 surround sound. It is worth checking out this article on sound cards by Tested.com. It has a good explanation as to what sound cards do exactly that improves the audio quality. Bare in mind, that if you have budget speakers that have average sound, sound cards will not make much of a difference. We recommend checking out this incredibly thorough article by KIRKVILLE dealing with placement and how to improve your listening experience. Mass production and technical improvements have made bookshelf speakers way more affordable. The improvements in amplifiers and digital signal processors, along with other components, has drastically improved the sound quality of entry level speakers, meaning that it isn’t that difficult to be a low budget audio enthusiast. We will look at various ways of improving your listening experience with your bookshelf speakers in the following section. When placing your speakers, their tweeter should be at ear height from where you are sitting. The left and right speakers should be exactly the same distance apart from your sitting position, keeping them roughly 18 inches or more away from room corners or pieces of large furniture that could hinder the ‘reflection’ of the speakers. You can always mount your bookshelf speakers on wall brackets or place them on furniture. If the room has uncovered window, tiled or hardwood floors, you can expect it to sound quite reverberant. Sparsely placed furniture in large rooms with exposed floors and a lot of glass windows are the most difficult to deal with. Simply adding drapes or thick rugs could drastically improve the acoustics. These tips were mostly derived from CNET.com’s article on How to make your speakers sound better, which is worth checking out, as they also have other details which may be relevant to your particular situation. Sometimes one will find that there is an underlying ‘hum’ or ‘buzz’ ever so steadily and incredibly annoyingly bleed out ones newly bought bookshelf speakers. This is usually caused by interference somewhere in the connections. We have sourced this excellent article from Audioholics and this equally thorough article by Axiom, both taking you through a detailed diagnosis and troubleshooting process that will almost certainly help you figure out where the problem lies and how you can resolve it. Most passive (unpowered) bookshelf speakers require some sort of amplification in order to get them to work. Unlike active (powered) speakers that have built in amps, passive speakers require some form of pre-amplification which adjusts the signals volume to a desired level, followed by a power amplifier to further boost the signal, making it strong enough to produce sound out of your speakers. One can now buy integrated amplifiers that are both pre-amps and amps combined, making it more affordable to set up your home studio and less space consuming. Have a look at Stereophile.com‘s reviews on various integrated amps to assist you in choosing the right integrated amplifier for you. Outdoor speakers have made it way more convenient to host events where outside audio is required. They are durable loudspeaker systems that endure the most severe of weather conditions while still performing at their optimal level. 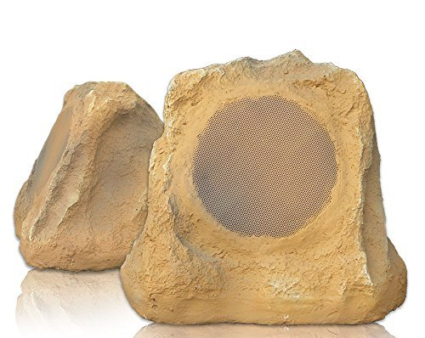 The following section explores various way of improving your outdoor speakers. In our Bluetooth speaker section above, we looked at various ways of diagnosing and troubleshooting Bluetooth stutter. Check further up if you are having any issues with stutter. One additional aspect that could be added here is possibly the need for a Bluetooth signal booster, which would essentially boost your Bluetooth signal strength, allowing you greater range. This would be great for the outdoor environment, as one is not always within accessible distance to their speakers, allowing you way more room to control your music. With outdoor speakers, bass reproduction does tend to suffer a tad due to not having a surface to bounce off, which tends to amplify bass. Outdoor speakers often sound flat, producing a stereo sound that lacks that low end thump. One should always be sure to look for outdoor speakers that go as low as 20-200 hz, otherwise a subwoofer could additionally be purchased in order to get the desired bass. In the case of purchasing an additional subwoofer, make sure to select a subwoofer that doesn’t produce muddy bass, but instead one that produces a tight, thumping bass sound that clearly accentuates bass tones. Be sure to do plenty of research before buying online if you can’t physically go into a speaker shop and listen to them yourself. Check customer reviews on sites such as Amazon, Wallmart or BestBuy, or alternately check if you can find a review on other speaker review sites. Electronic House has compiled a great list of outdoor subwoofers. Click here to check the article on subwoofers they have recommended. In the case of purchasing an additional subwoofer, make sure to select a subwoofer that doesn’t produce muddy bass, but instead one that produces a tight, thumping bass sound that clearly accentuates bass tones. Be sure to do plenty of research before buying online if you can’t physically go into a speaker shop and listen to them yourself. Check customer reviews on sites such as Amazon, Walmart or BestBuy, or alternately check if you can find a review on other speaker review sites. 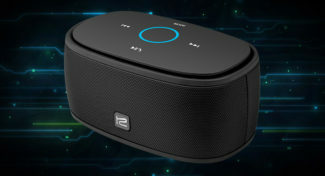 ElectronicHouse.com, for example, has compiled a great list of outdoor subwoofers. 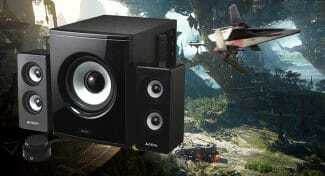 Click here to check the article on subwoofers they have recommended. In addition to needing great quality speakers, the placement of those speakers is critical to your audio quality. Bassheadspeakers.com has a great article that covers everything you need to know about speaker placement. They give an incredibly thorough guide to setting up your outdoor speakers and the correct positioning required to maximize your overall listening experience. When it comes to amplifiers, one needs to first check if the speakers they have purchased are passive or active. Active speakers are self-powered, meaning they will play on their own. Passive speakers do however require amplification as they do not have an internal power source like active speakers do. Everyone who enjoys good audio needs to make sure they do plenty of research on whatever type of speaker they decide to purchase. We live in a world where mass communication has made life significantly easier for us. This means one can simply access the Internet, enabling you to easily to get whatever information you need. Good speakers are a must, as their is nothing more annoying than buying a pair of speakes for whatever you may use them for, then to find they only half satisfy your desire. We can not emphasize the importance of researching what it is you are looking for, thereby greatly reducing the odds of getting a bad pair of speakers.